The Trend Hunter strategy is the strongest and most reliable strategy in financial markets that generate Maximum Profit with Minimum Risk. Trend Hunter shows where the beginning of a big trend is and the price zone it will start from. Quite simply, it shows when to hunt it and to trade it. It follows the trend while it has an acceptable profitability and earns the maximum profit out of the trend. By declaring the end of the trend, it adds a huge profit to the balance of our account. The probability and the amount of its loss is minimum. This strategy is market independent and is useful in all kinds of markets such as Stock, Forex, CryptoCurrency, Commodity, Index, etc. It has even generated remarkable profits in Bitcoin, Ethereum and other Cryptocurrencies, so, Learn it and enter into the world of trading opportunities and investment. As of its name, “Trend Hunter Strategy” is of profitable strategies in trending markets and it takes almost all the "advantages of trade in trends". Many of strategies use a lot of indicators and complicated dummy methods, but trend hunter strategy shows you, how you can guarantee a continuous profit for yourself by using a raw chart and only relying on the price action in certain levels of the market. (Using RSI or MA indicators is recommended, but not an obligation). One of our main priorities is to simplify learning and trading, so be sure that you can simply learn this strategy and you will trade on it so simply. Trend Hunter strategy has two versions, simple and professional. The Simple version of Trend Hunter Strategy, despite its simplicity, is highly profitable. This strategy is specially designed for those who can watch the market in a short time. In this strategy, "Weekly forecasts" and "Daily-Trading-Opportunities(DTO)" show you the "Beginning of a Trend". So, after placing trades, you wouldn't have to do anything else for weeks and months. and you will have your profit added to the balance of your account every day and week until the "End of Trend". The simple version of trend hunter strategy is absolutely free, and you can learn its parts (located in the sidebar menu). Example: The figure shows the Simple version of Trend hunter strategy in practice. As seen, in the currency pair EUR/JPY after placing Buy trades and setting take profit targets, within 5 months 10 trades were closed with total profit of 9355 (PIP) so far, and after some months by declaring the "End of the Up Trend", the 11th trade was also closed with a profit of 3330(PIP). Therefore, without spending time watching charts during these months, we were able to earn a profit of 12685(PIP). 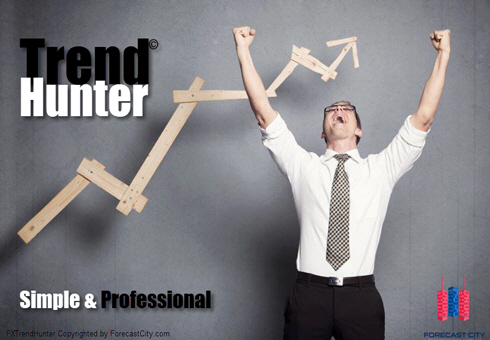 The professional version of Trend Hunter strategy is designed for those who want to invest and trade in the financial markets professionally. The combination of the strongest techniques and analysis and investments enables professional (and semi-professional) traders to experience the maximum profitability with the minimum risk and minimum investment. The professional version of “Trend Hunter Strategy”, enters the market with a short-term trend, it adds to the volume of previous trades, if the beginning of mid-term or long-term trends is seen. So in this strategy, there is no need for an initial vast fund and the investment is increased gradually, without increasing the risk. Trend Hunter strategy has proven, in its 20 years of age, that it is actually the strongest strategy for investment in all financial markets.